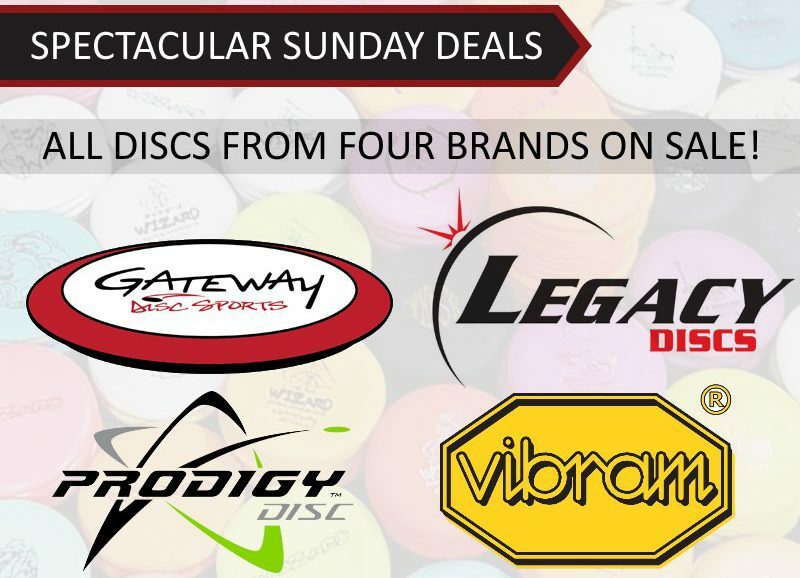 For spectacular Sunday, all Gateway, Legacy, Prodigy, and Vibram discs will be on sale. These “mid major” brands make excellent discs that the casual disc golfer may not be familiar with. Gateway – Gateway has a full lineup of discs, but they are most well known for their top selling putters. The Gateway Wizard is one of the most popular selling putters on the market and is available in dozens of plastic blends — the most popular being Super Stupid Soft. One fun thing about Gateway putters is that they are available in a variety of different stamp types including popular the Infinite Bomber and Illuminati stamps. Gateway putter plastics are on sale today for just $8.99. Legacy – Legacy discs also offers a full selection of discs. They regularly release unique limited edition stamps and beautiful plastic blends. If you’re interested in trying out Legacy discs while they are on sell, their most popular selling discs are drivers including the Outlaw, Enemy, Rival, Cannon, and Patriot. Prodigy – Prodigy discs offers premium plastic discs with easy release technology that provides a comfortable feel and in many cases — more distance. For an even better deal on Prodigy discs, be sure to check out our huge selection of Prodigy factory seconds and misprints. Our top selling Prodigy discs are as follows: A4, D6, D2, D3, PA-1, and M4. Vibram – Vibram offers a unique disc golf experience in that Vibram discs are actually made out of rubber rather than plastic. These discs offer exceptional grip, especially in cold and wet conditions. Vibram Soft is even more unique in that this blend is completely floppy and you can literally fold these discs in half. The Onyx and unLace are perhaps two of the best disc golf drivers available for beginners. The uniqueness of Vibram discs make them a great gift idea for the disc golfer. The Lace is Vibram’s top selling disc. During the sales weekend, we are discounting ALL discs by temporarily subsidizing our normal shipping charges. Shipping for a one disc order this weekend is only $1.99 and the max disc shipping cost is just $4.69! The more discs you purchase, the more money you save, even if you’re purchasing a disc that isn’t on sale today. Vibram Disc Golf is stepping it up with their best holiday promotion yet! 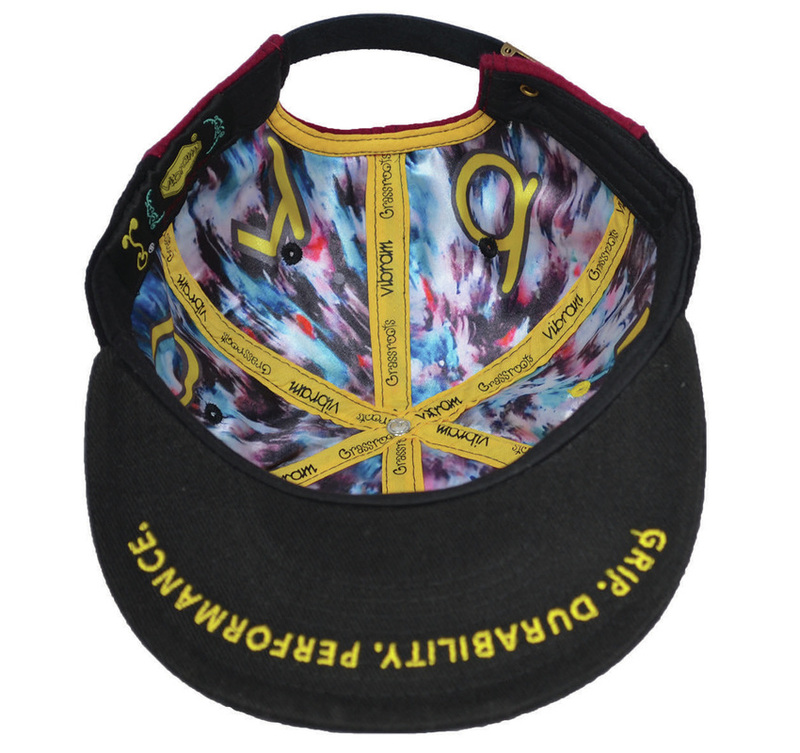 This year, customers who purchase at least four Vibram discs are eligible to receive a genuine Grassroots California Hat. 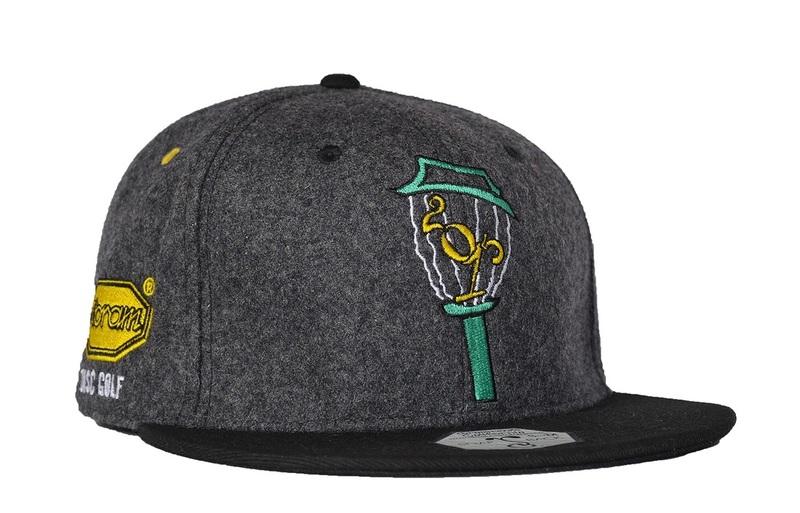 This stylish hat has a custom silk lining and a hidden pocket. There are two different hat variations to choose from in sizes S/M or L/XL. 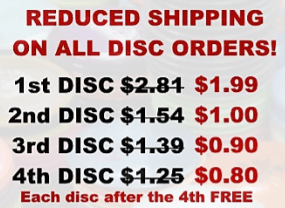 To make this promotion even more enticing, you can get your 4 Vibram discs from Infinite Discs for less than $60! Enter Discount Code: Vibram4for60 at checkout. Purchase at least 4 Vibram discs between November 19th and December 31st. Vibram will ship your free hat directly to you. 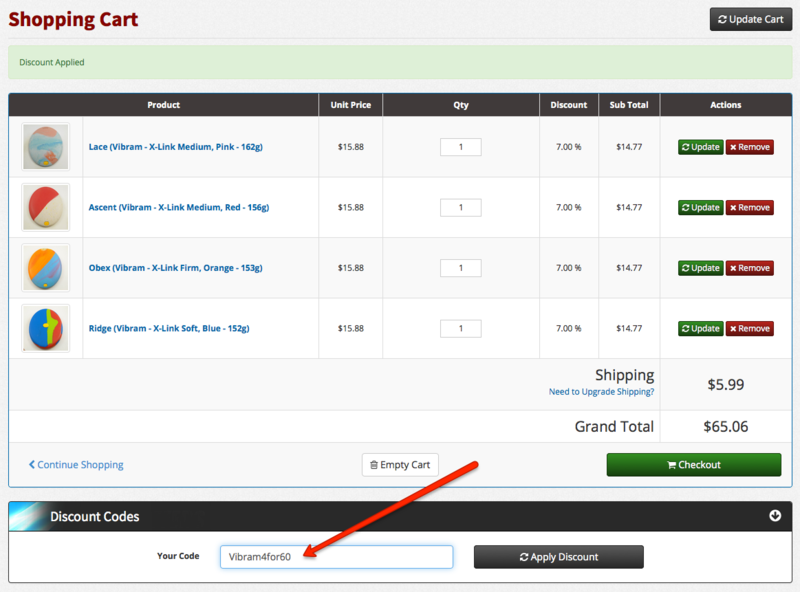 Select the four Vibram discs you want here! Note 1: This article takes real data from real survey results, and then they are published with educated opinion. You may not agree with everything you read, and that’s completely ok. Please leave any of your thoughts or comments below. Rude, belligerent, or otherwise inappropriate comments will not be published. Note 2: We acknowledge and emphasize to you that the results here directly reflect the disc golf community who is in some way, shape, or form, involved with disc golf online. We therefore recognize that it would be inaccurate for us to claim that this survey is a proper reflection of the entire disc golf community. The results portray disc golfers who found this survey via Facebook, Twitter, Reddit, Google+, forums, E-mail, and other means. With over 1,400 respondents the statistical accuracy is high. While there are several brands, some manufacturers actually produce products for other brands. To best illustrate this we’ll use the MVP as our example. In January 2014 MVP launched a new brand called Axiom. MVP discs & Axiom discs are both produced by MVP Disc Sports, however Axiom is its own product lineup and brand. Q: Which manufacturer is the leader in disc golf today? Which manufacturer disc golfers believed was the leader in disc golf today? The answer wasn’t even close. Innova took it by the largest margin of any other question in the survey. In contrast to the data in the last survey “Which brand is your favorite?” is what makes the results here more intriguing. While bias likely works into the answers for many when taking a survey such as this, it shows bias was largely set aside. 38% of people responded that Innova was their favorite brand, but 74% responded that Innova is todays leading manufacturer. 3 in 4 disc golfers voted that Innova is the top manufacturer today, even if Innova wasn’t their choice of disc. Q: Which manufacturer are you looking forward to new releases from the most? This question had a very nice spread when compared to the landslide of the last question. MVP is impressive here not only because they placed first With 20% of disc golfers most excited for releases from MVP, but also because this is a small company which currently has a very small market share. MVP has created hype around each release, and their distance driver lineup which is coming out this spring is the most anticipated release that we can remember. In addition, from our point of view MVP also lives up to the hype that they create with each release – consistency and quality is a staple when working with MVP. The next three are Latitude 64, Innova, and Prodigy with 18%, 16% and 14% of the votes respectively. From our view Latitude 64 is establishing itself as a major player in the industry and has a strong following which faithfully buy whatever the product. Innova has also produced a handful of top selling discs the last two years with Krait, Tern, and now their overmold plastic options with the Atlas and Nova has also turned heads. Finally Prodigy, who according to their number system has released a majority of the discs which will be released, how will they adapt in 2014? More signature series? Q: Which manufacturer has the best public reputation? Innova takes first place again at 50%. Second place is Discraft with 16%, Latitude 64 with 11%, MVP with 7%, and everybody from there has just a small share. Innova’s dominance in this category was honestly a surprise. While we are not questioning Innova having a solid reputation, I (the author) feel that many brands are also deserving of the top vote for many. Perhaps next time, this question will be rephrased to ask “On a scale of 1-10, how would you rate the reputation of such and such company.” That question will give us a better thermometer reading of how different manufacturers are doing for the disc golf world. Kudos to Innova for doing an overall fantastic job! The results don’t lie! Q: Which manufacturer is the most Innovative? And we’re back to MVP, except MVP now takes it by a larger margin. MVP certainly has a unique way of doing things, and it’s catchy… and according to respondents, it’s Innovative. In second place is Innova, with less than half the votes of MVP. Innova is large, and continues to adapt. For example, noting the success of MVP, Innova developed their own overmold style. Innova has a steady stream of discs annually which frequently seems to fill a void in what seems to be a very well built lineup. Latitude 64, Prodigy, and Vibram round out the next three – each with unique aspects they bring to the game! Q: If you could have discs made by only one manufacturer, which would it be? Innova strikes again. Most disc golfers would choose Innova if they could throw with only one brand, and it’s not hard to see why. Innova has something for just about everybody. At the same time, it’s not hard to see why many of the other brands are chosen. The reality is, you don’t always need a disc for every possible situation, you need discs only for the scenarios which you play one. Many players choose only a handful of discs because they are versatile and they simply love them, so it’s easy to see where fan bias plays into this question more. Latitude 64 takes second place with Discraft not far behind. 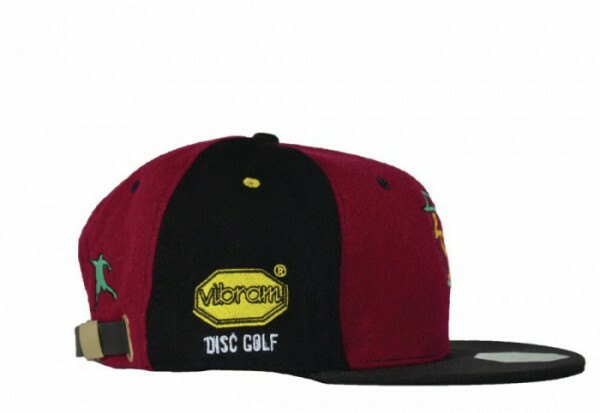 Q: Which manufacturer made the largest impact to disc golf in 2013? First place goes to Prodigy who garnered 40% of the votes here, and again, it’s not hard to see why. January 1, 2013 was the first day most of the disc golf world ever heard the name Prodigy, and it is now common to nearly all disc golfers. In fact, in the next article we’ll focus on brand awareness, but to give a sneak peak, over 73% of respondents said they are familiar with the brand Prodigy. Only 8% said that are not familiar at all. That is an amazing feat in one year of business by nearly all standards. Be it the D1, or PA-1, it’s hard to play disc golf with a league or club where somebody does not regularly use a Prodigy disc. Innova, MVP, and Latitude 64 were others who gathered a reasonable amount of votes. Each had a number of very popular releases which, like Prodigy, are hard not to find in a nearby players bag. Q: Which manufacturer made the largest impact to disc golf in 2014? People still expect big things from Prodigy in 2014, who gathered 18% of the votes for this question. However, first place goes to (you guessed it) MVP who gathered 19% of the votes. There are many ways which a disc golf company can make an impact – PDGA National Tour tournaments, or grass-roots efforts like the Vibram Birdie Bash and Discraft Ace Race. To date, MVP has not done any of these things, but they have created a new brand, they’re releasing new discs – so 2014 has not disappointed yet. Even though they’re small, MVP has made a splash! They’re tenacious and Is the best still to come from company which has already amazed in so many ways in 2014? Near the top of the pack each time was Latitude 64, the manufacturer for Westside and Dynamic Discs. The Scandinavian-made plastic (aka, Trilogy), has earned a solid reputation as a fair sized contingent of the disc golf industry trades out their old plastic for any one of these brands. It is my speculation that given the current course of Latitude 64 they will be rivaling Innova for the top spot in the disc golf market. Innova is #1. When you’re the largest disc golf manufacturer in the world, it is inevitable that complaints will be voiced. Innova has already been through the growing pains which others are currently experiencing, and they’re in a stride. They are still most respected as #1 and have set a high mark for others to rise to. Innova will be hard to catch as their current pace will not be shrinking. Instead, the way to catch up with Innova will be to continue to grow the overall disc golf scene (which companies such as Dynamic Discs have been doing a remarkable job) and to create brand loyal fans.